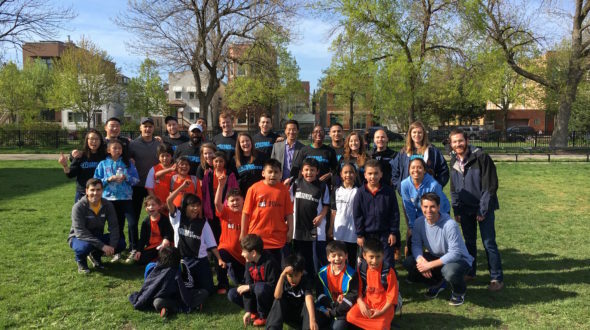 #UIJB member Patrick Mahal shares his experience from this year’s Junior Board Volunteer Day with the Otis Work to Play team! Friday April 29th began as any typical Chicago Spring day – grey, cold and windy. 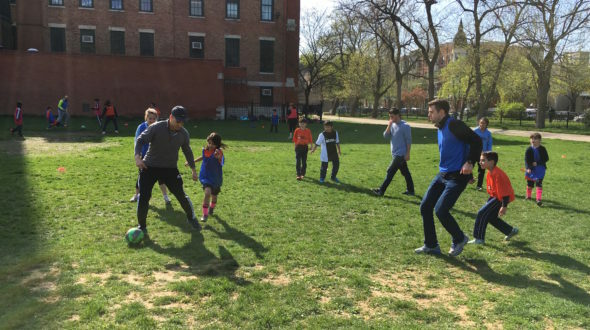 While the city counted down the minutes for the weekend to begin, Students inside Otis Elementary counted down the minutes for the kickoff whistle to sound. UI staff and volunteer Junior Board members filled three pitches and were excited for the afternoon ahead. As the sun peaked out and the last goal was staked into the ground, a thunderous roar poured out of the school. It was the students, and it was game time. They rushed the field in anticipation of what would turn out to be a very successful 2016 Junior Board Volunteer Day. 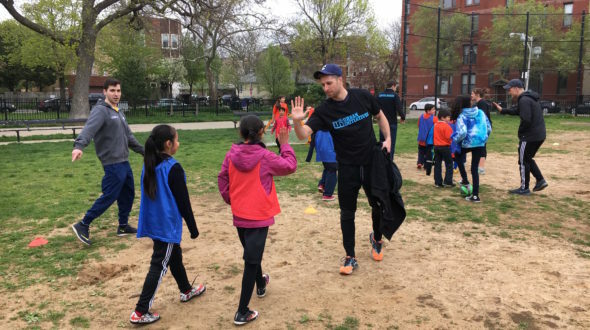 Students from Otis Elementary enjoyed an afternoon of four 20 minute games with teammates and opponents much taller (but not necessarily more talented) than they are used to. Members of the Junior Board had the opportunity to meet and interact with the students we serve by playing and coaching throughout the event. The afternoon wrapped up with a conversation amongst the coaches and players about teamwork, healthy lifestyle tips, pictures and a healthy snack. I personally learned that the kids are extremely polite (they refused to call me anything but “Coach Patrick” despite my novice skill level) and are extremely intelligent (moments after experiencing my novice skill level asked if I’d prefer to play goalie for the afternoon…). The 2016 Junior Board Volunteer day was a huge success and further cemented the value and purpose I see in the programs Urban Initiatives provides our youth. 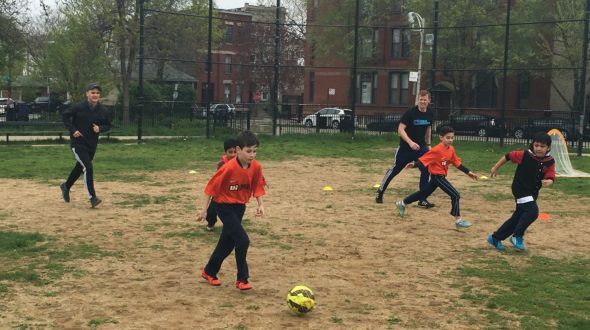 While it’s no surprise how intelligent and charismatic the students at Otis are, it amazes me how little they need to show off their positive and fun-natured spirits – a pitch, a ball and a teammate. I applaud Urban Initiatives for dedicating time and resources to delivering these seemingly simple ingredients to communities where they are anything but. I look forward to volunteering my time again in the near future, and invite you to come out and experience first-hand the rewarding feeling you receive after getting a “thank you, coach” and a high five from a student.